An intuitive bingo card creator for creating home printable bingo cards. 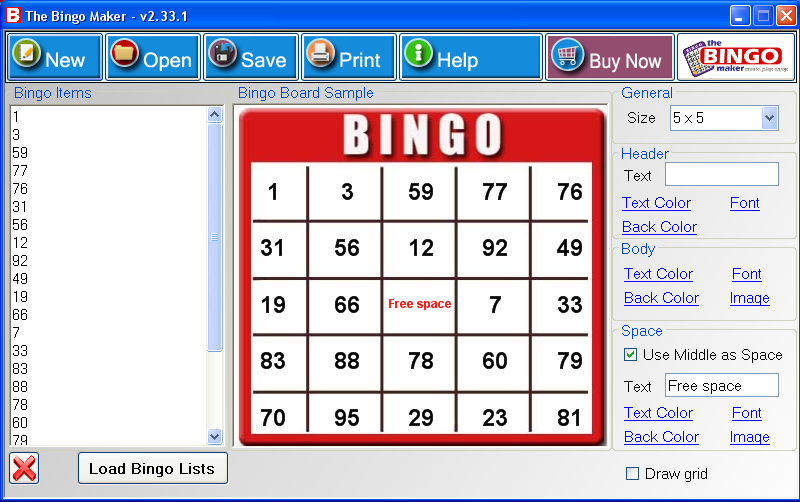 The Bingo Maker bingo card maker creates high quality bingo cards that can be printed using your home computer or a professional printing service. Personalization features include images, backgrounds, fonts, colors and allow fast bingo card creation using numerous templates. The Bingo Maker bingo card maker has pre-made templates for both educational and recreational purposes; Create bingo cards from pre made templates for holidays, Christmas, Halloween, baby showers, bridal showers, educational bingo (math, expanding vocabulary and ESL). Features also include custom imaging for both background and bingo space item with an easy to use image cropping tool. Print or export (PDF format) your bingo game in minutes including ready to cut bingo call list.